­The system operationally provides air quality forecast at 24h and 48h for Europe (12x12 km), the Iberian Peninsula (4x4 km) Andalusia (1x1 km), Canary Islands (2x2 km), Catalonia (1x1 km) and Madrid (1x1 km) by means nesting techniques. Meteorological forecast: temperature, precipitation, humidity, pressure, cloud cover, wind direction and speed, among other. Emission forecast: nitrogen oxides (NO and NO2), volatile organic compounds (VOCs), carbon monoxide (CO), sulfur dioxide (SO2) and particulate matter (PM). Air quality forecast: O3, NO2, CO, SO2, PM10, PM2.5 and benzene. Summary sheets of the annual forecast (statistical and graphics). CALIOPE system also provides forecast for meteorology and emissions for each study. 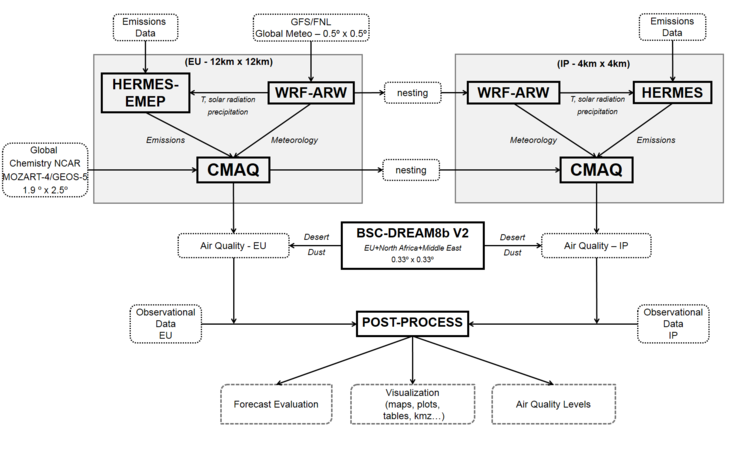 CALIOPE system represents the current state of knowledge on modelling issues of air quality forecast worldwide. The system has been evaluated in a diagnostic mode, based on the year 2004, several studies published during the past four years. CALIOPE forecast mode as been evaluated on years 2009 and 2011. In addition, since 2009 the system has been evaluated continuously (NRT: Near Real Time) with hourly observations (see evaluation of the forecast). The CALIOPE system setting is showing in the next table for the European (EU) and Iberian Peninsula (IP) domains, since 2007, when the forecast system started operationally. * When the setting is different to both domains, the setting is shown for each one (emissions and Kalman filter).